Lava shoots into the night sky from active fissures on the lower east rift of the Kilauea volcano, Tuesday, May 15, 2018, near Pahoa, Hawaii. April showers bring May volcanic eruptions. When the Kilauea volcano erupted on Hawaii's Big Island earlier this month, it set the stage for a lot of stunning scenes. But it also posed a mortal threat to scores of people across the island, as toxic chemicals infiltrated the air and molten rock poured into the ocean. Elsewhere in the world, May meant drought and scorching temperatures — less than ideal conditions for the whole "April showers bring May flowers" expectation. A heatwave in Karachi, Pakistan, killed at least 65 people and drought in Heilongjiang Province, China, caused water levels to hit their lowest point in a decade. Other places of the world seemed as if they were still stuck in April. A monsoon in Colombo, Sri Lanka, brought rains so heavy that eight people died and more than 1,000 homes were destroyed. 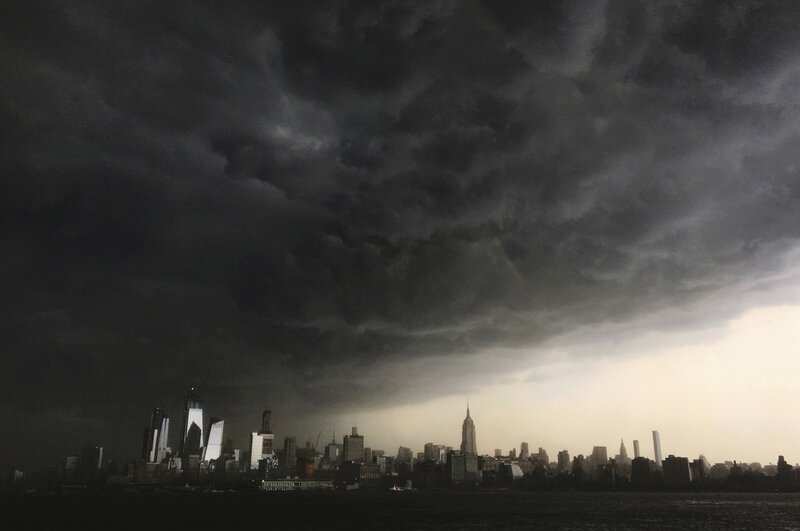 New York, meanwhile, saw storm clouds of biblical proportions and many rainy days. Here are 22 of the most stunning environmental images from the past month. 1. 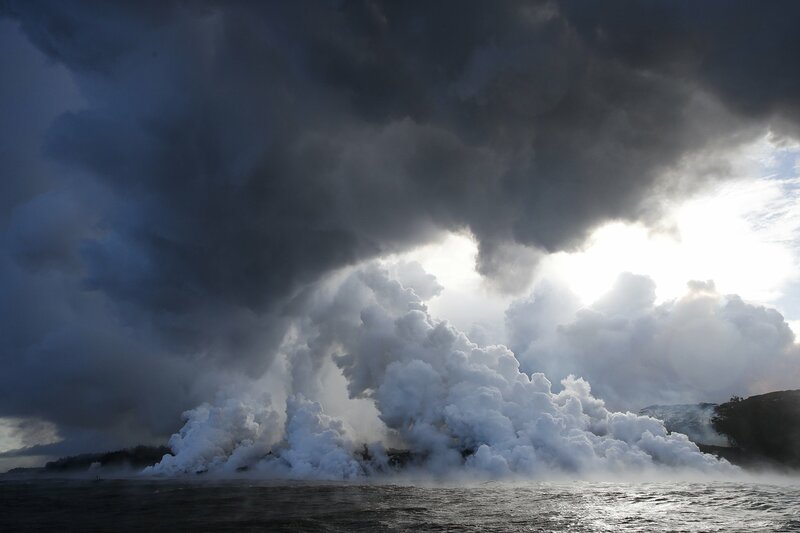 Hawaii Volcano: Plumes of steam rise as lava enters the ocean near Pahoa, Hawaii, on May 20. 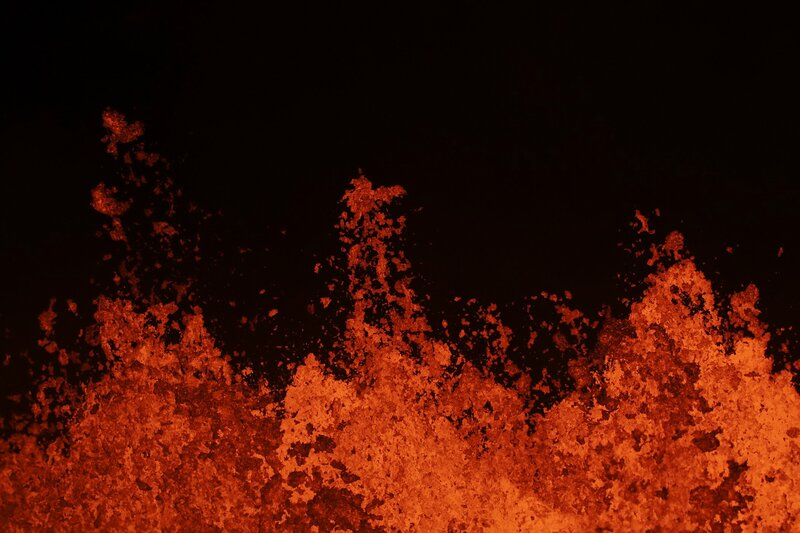 The Kilauea volcano that is oozing, spewing, and exploding on Hawaii's Big Island has gotten more hazardous in recent days, with rivers of molten rock pouring into the ocean Sunday and flying lava causing the first major injury. 2. New York Storm: Storm clouds gather over New York City seen from the Hudson River on May 15. A line of strong storms pushed across New York City and badly disrupted the evening commute, stranding thousands of train riders. 3. Drought in China: A man walks on the banks of the Songhujiang River, which have been exposed by severe drought, on May 23 in Harbin of Heilongjiang Province, China. The water level of the Harbin section of the Songhua River is 1.74 meters lower than normal — the lowest it has been in the last 10 years. It has reportedly been caused by a dam controlling the water flow further upstream. 4. Summer Weather in Pakistan: Pakistani workers cool down with water during a hot summer day in Karachi on May 20. 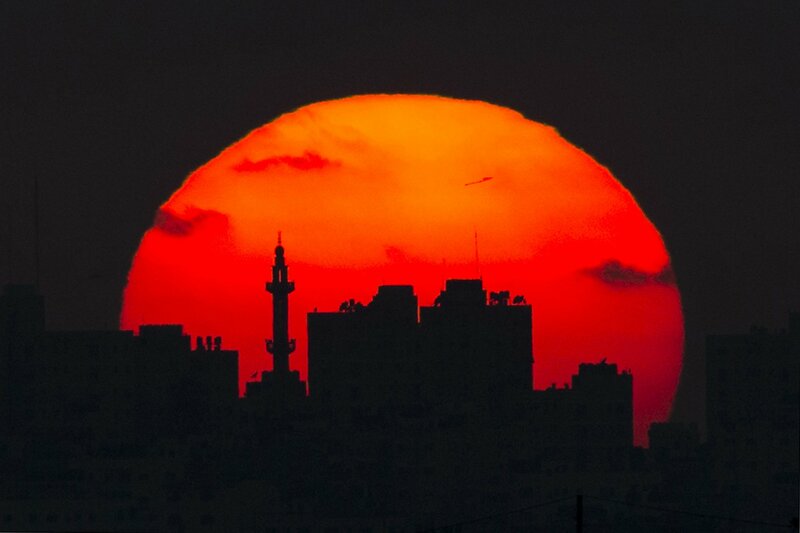 5.Sunset in Gaza: The sun sets behind a mosque and other buildings in the Gaza Strip on May 15. 6. Hawaii Volcanic Fumes: Sgt. 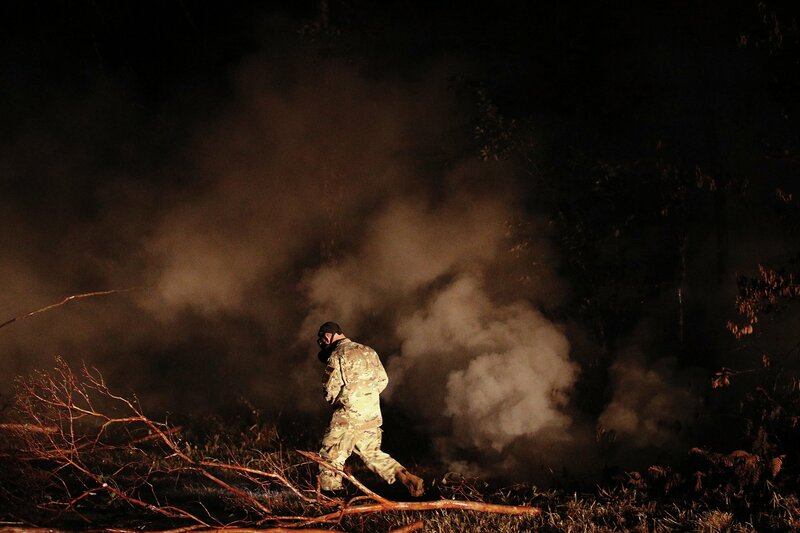 1st Class Carl Satterwaite, of the US National Guard, tests air quality near cracks emitting volcanic gases from a lava flow in the Leilani Estates subdivision near Pahoa, Hawaii, on May 10. 7. Wildfire in India: Wildfires burn through jungle near the northern hill town of Shimla in the Indian state of Himachal Pradesh on May 20. 8. 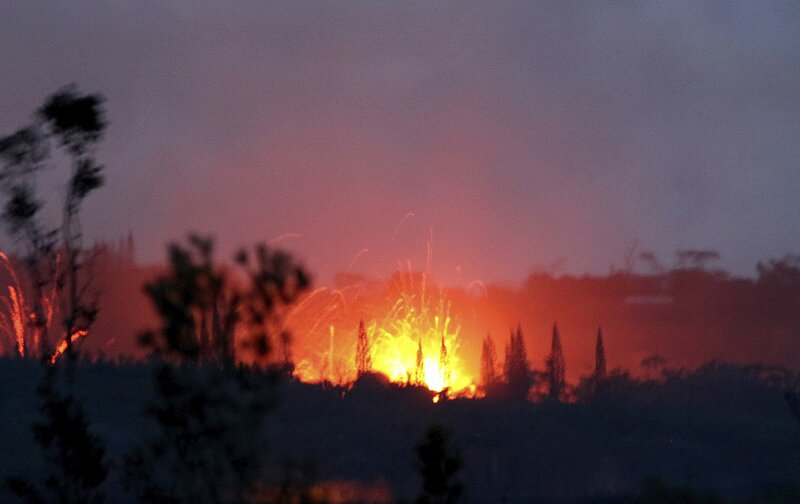 Hawaii Lava: Lava erupts from a fissure in Kapoho, Hawaii, on May 21. The eruption of Kilauea volcano in Hawaii sparked new safety warnings about toxic gas on the Big Island's southern coastline after lava began flowing into the ocean and setting off a chemical reaction. 10. Elementary School Protest: Kindergarten students from Brooklyn's P.S. 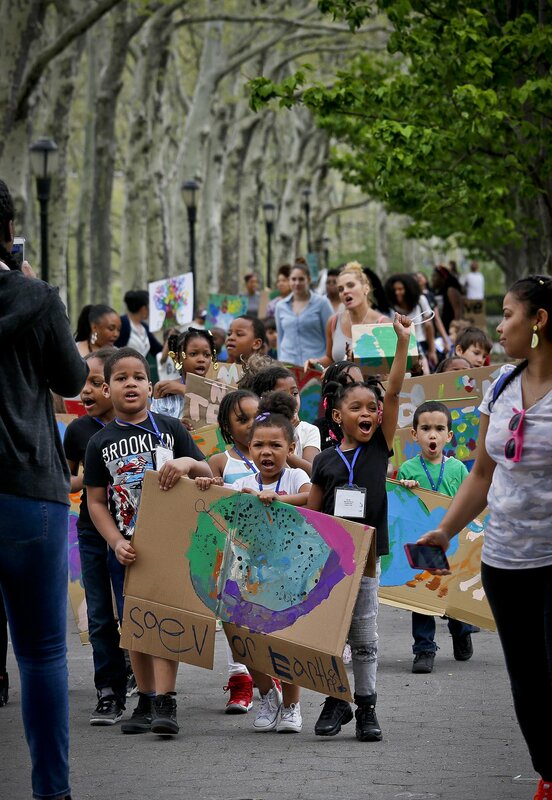 307 are escorted by teachers and assistants as they demonstrate and march, chanting, "Save our earth," during a rally in Cadman Plaza Park to remind people to protect the environment, on May 4 in the Brooklyn borough of New York. 11. 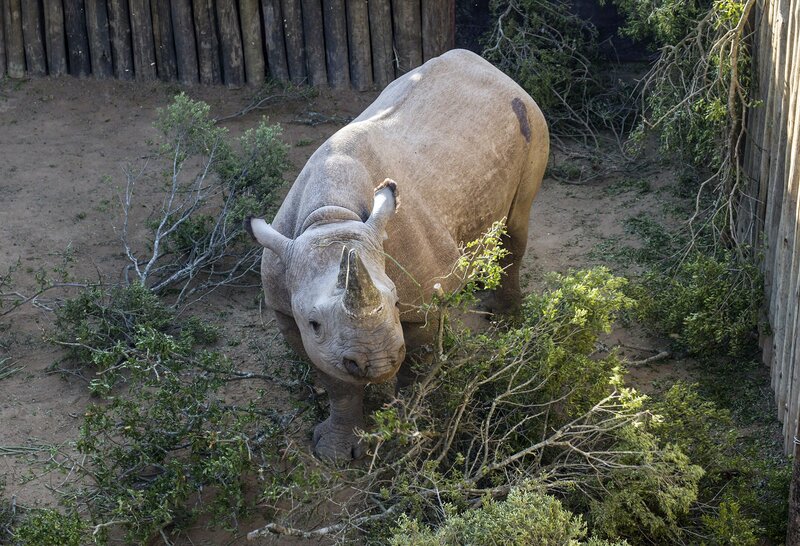 Rhino Conservation: A rhino in its enclosure in the Addo Elephant Park, near Port Elizabeth, South Africa, on the eve of being transported to Zakouma National Park in Chad on May 2. Six critically endangered black rhinos are being sent from South Africa to Chad, restoring the species to the country in north-central Africa nearly half a century after it was wiped out there. 12. Sri Lanka Flooding: Sri Lankan men push their motorbike along a flooded street in the suburb of Kaduwela in Colombo on May 22, as monsoon rains lashed large parts of the island. Flood-related accidents have killed at least eight people and damaged nearly 1,000 homes this week, according the Disaster Management Center. 13. Bazar In Dhaka: A Bangladeshi vegetable vendor waits for a customer in a waterlogged kitchen market at Karwan Bazar in Dhaka, Bangladesh, on May 13 after monsoon-heavy rains. Roads were partially submerged, making travel hazardous. 14. Hawaii Volcanic Eruption: Lava shoots into the night sky from active fissures on the lower-east rift of the Kilauea volcano on May 15, near Pahoa, Hawaii. 15. Syrian Daily Life: Syrian children swim in the dam of the city of Daraa after recent heavy rainfalls on May 2. 16.Humpback Whales: A group of humpback whales feed in the Stellwagen Bank National Marine Sanctuary on May 10 near Gloucester, Massachusetts. The humpbacks were feeding on sand eels by utilizing the bubble net method to trap the eels and then swimming up through it with their mouths open. 17. Plastic Pollution: An Afghan woman walks next to a pile of trash full of plastic bags in Kabul, Afghanistan, on May 6. 18. 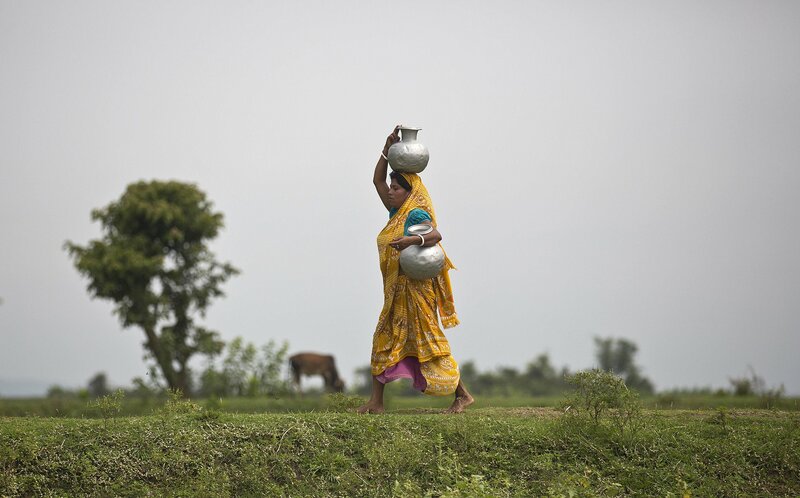 Water in India: An Indian woman returns home after fetching drinking water on the outskirts of Gauhati, India, on May 9. The UN estimates that more than 1 in 6 people worldwide do not have access to 5-13 gallons of safe freshwater a day to ensure their basic needs for drinking, cooking, and cleaning. 19. 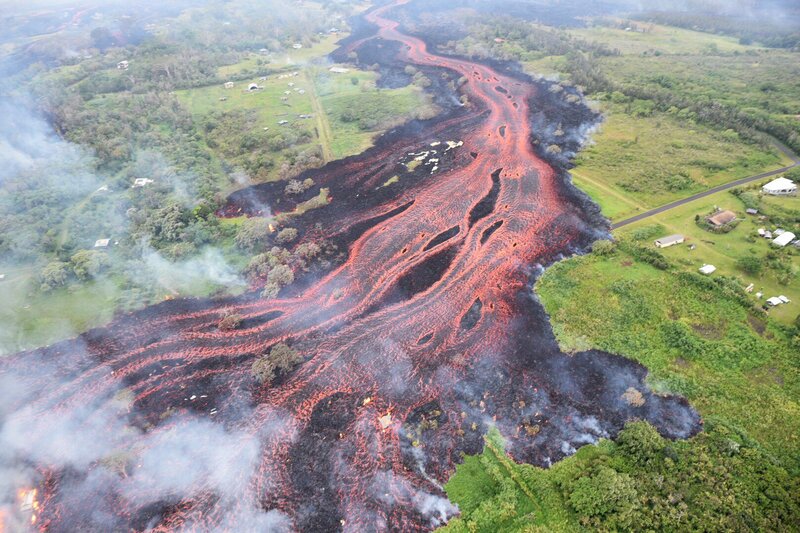 Lava in Hawaii: In this May 19 aerial file photo released by the US Geological Survey, lava flows from fissures near Pahoa, Hawaii. White plumes of acid and extremely fine shards of glass billowed into the sky over Hawaii as molten rock from Kilauea volcano poured into the ocean, creating yet another hazard from an eruption that began more than two weeks ago: a toxic steam cloud. 20. Colombian Dam: Destroyed homes lay in ruin after flooding from the Cauca River, caused by structural damage to the Hidroituango hydroelectric dam, in Puerto Valdivia, Antioquia Department, Colombia, on May 20. A worsening crisis at an unfinished $4 billion dam in northwest Colombia is causing widespread flooding, displacing thousands of residents and threatening the largest hydroelectric project ever undertaken in the South American country. 21. Rare Pink Flamingo Appears In Miami: A lone pink flamingo is seen as it walks along Haulover Beach on May 17 in Miami Beach, Florida. Lifeguards on the beach said that the flamingo showed up on Saturday and has been hanging around since. Biologists say that it is unusual for the birds to fly solo and are keeping an eye on the bird in case it becomes distressed. 22. Kenya Flooding Disaster: A woman with a child strapped on her back walks up a hill through mud and debris on May 11 after a dam burst its banks, sending muddy waters raging through homes and killing at least 45 people in Subukia, Nakuru county. Kenya's top prosecutor has ordered a probe into the collapse of the dam on the night of May 10, as questions mount over the quality of construction of the private reservoir on a vast farming estate.